We craft each round three stone engagement ring using the finest natural round brilliant cut diamonds. 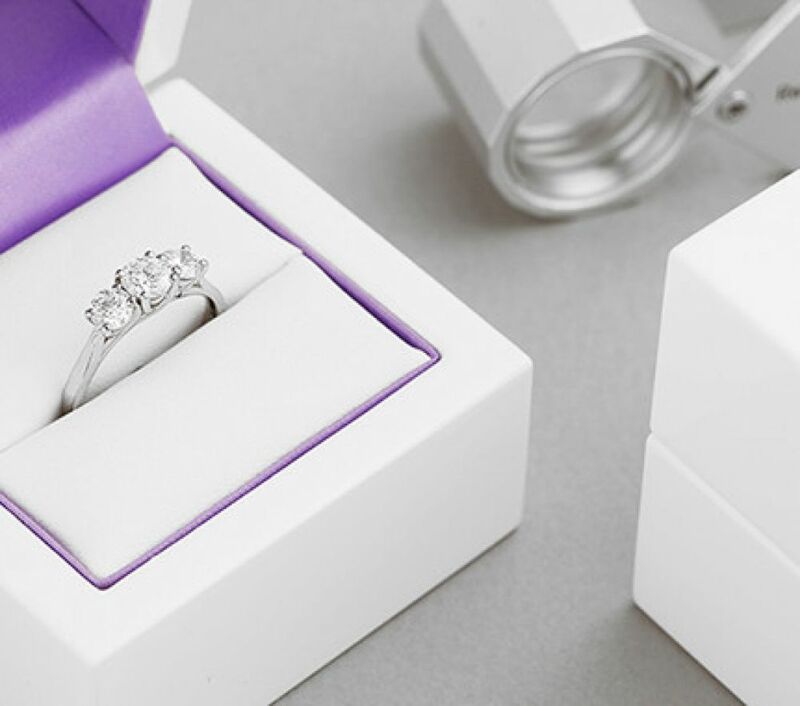 From bold graduating three stone designs to elegant traditional trilogy styles, enjoy our beautiful collection wrapped up within beautiful packaging, insured delivery, 60 days returns and presented in pristine luxury packaging for the perfect experience. Georgiana dazzles with a spectacular display of diamonds. This distinctive three stone diamond trilogy ring is perfect for an engagement or for an anniversary. We hand select each round brilliant cut diamond for maximum brilliance, enhanced by channel set diamond shoulders for additional sparkle. The Georgiana three stone engagement ring comes in 3 carat weight options. Choose from 0.75cts, 1.00cts and 1.25cts including the shoulder diamond weight. Each round brilliant cut diamond is equally sized, held above Princess cut diamonds channel set into each shoulder. The band is flat court shaped, with a curved comfort fit which can be matched perfectly alongside a wedding ring. The Victoria three stone engagement ring combines modern craftsmanship with traditional styling. We offer you the opportunity to commission an exceptional three stone ring design, set with beautifully matched round brilliant cut diamonds. With many diamond carat weight options, this traditional classic design features claw settings to protect a matched set of round brilliant cut diamonds, graduating in size. Smaller outer round brilliant cut diamonds are placed either side of the larger central diamond. Open shoulders elegantly taper from the court comfort fit band. Please allow 3-4 weeks for this ring to be created. Beautifully boxed and packaged as shown below. Classic full bezel set 3 stone graduated round brilliant cut diamond engagement ring. Three stone design. Traditional graduating set of diamonds, with larger central diamond. Choice of 0.45cts or 0.65cts carat weights. G colour SI1 clarity. Wood boxed and gift packaged. Approx. 3 weeks for delivery. 3 stone tension set round diamond engagement ring, with precision set diamonds between modern tapering crossover shoulders. Ultramodern 3 stone diamond ring design. Precision set matched round brilliant cut diamonds, equally sized, held within the shoulders of this cutting-edge design. Created with high colour and clarity diamonds with a total diamonds weight of 0.55 carats. Please allow 4 weeks for this design to be completed. Wood boxed and gift packaged. 3 stone round brilliant cut diamond trilogy style ring with wedding ring friendly fit and graduated diamond sizes. A contemporary 3 stone round diamond trilogy style ring with graduated diamonds. Each diamond is held within a very modern claw setting with built-in wedding ring friendly fit. The style has been completed with beautifully styled court profile shoulders and band. Wedding ring available to order separately. 3-4 weeks for completion. Classic 3 stone diamond engagement ring with claw set graduated round brilliant cut diamonds. Claw set, classic design, created around a matching set of 3 round brilliant cut diamonds. Fine open tapering shoulders adjoin the setting offered in a choice of carat weight options. Typically offered in G colour and SI1 clarity within 3-4 weeks of ordering. A lovely classic design with a timeless feel. Sleek, modern 3 stone diamond ring design, set with graduated round brilliant cut diamonds across crossover shoulders. A modern 3 stone graduated diamond ring design, set with matching round brilliant cut diamonds. Small round claws hold the precision set diamonds, between sleek, ultramodern crossover shoulders which narrow towards the setting. This design takes around 3-4 weeks to complete with your chosen diamond weight. Wood boxed and securely packaged. Modern classic, simple design 3 stone round diamond engagement ring with claw setting. 3 stone graduated diamond ring design, with a simple modern setting. 3 matched round brilliant cut diamonds are held within claw settings above slim, tapering shoulders with a court profile band. 3-4 weeks for completion. Beautifully packaged as shown in our example. Offered in various carat weight options for personalisation. Uniquely styled 3 stone twist diamond engagement ring with 4 claw settings across a simple and innovative ring design. 3 stone trilogy style ring design, with slender shoulders and unique twist settings to hold 3 beautifully matched round brilliant cut diamonds. The ring is formed as a single piece in any metal choice and offered in a range of carat weight options, with beautifully white, eye clean diamonds (G colour SI1 clarity) Timescale is around 3-4 weeks for completion prior to shipping. One of our most elegant 3 stone diamond rings set with round brilliant cut diamonds graduating in size. Elegant design. Claw set with three graduated diamonds. Solid shoulders. Crossover Lucida style design. Court ring profile. Available in 18 Carat Yellow Gold, 18 Carat White Gold and 950 Platinum. Wood boxed, gift packaged, approx. 3 weeks delivery. Striking 3 stone round brilliant cut diamond engagement ring with 3 equally sized diamonds set within a modern crossover precision set design. Modern precision set design, with crossover styling. 3 matched, equally sized round diamonds in a range of carat weight options are precision set within this fabulous ring design. Choose from 3.5mm (0.50 carat option) 4mm (0.75 carat option) and 4.5mm (1 carat option) diamonds with each ring being scaled to the diamond sizes. 1 carat option shown in our image. Please allow around 3-4 weeks for completion. Styled with equally sized diamonds, this splendid 3 stone diamond ring provides a unique modern show across a perfectly matched set of diamonds. Stylish design. Claw set with three equal sized diamonds. Straight, open shoulders. Court ring profile. Available in 18ct Yellow Gold, 18ct White Gold and 950 Platinum. Wood boxed, gift packaged. Approx. 3 weeks delivery. 3 stone round diamond engagement ring, with unusual design, featuring a graduating set of round diamonds in part bezel and part claw settings. A modern and unusual 3 stone diamond engagement ring design. A perfect set of graduating diamonds are held within partially exposed claw and bezel settings with a flowing wave design, over substantial solid shoulders. We provide many options for the carat weight and all rings are carefully crafted and finished to perfection within 3 to 4 weeks of placing any order. Your ring is then sent fully insured and beautifully packaged. Distinctively styled, the Sashca three stone engagement ring is expertly crafted for the perfect finish. Sweeping shoulders embrace the trilogy setting which features three matching round brilliant cut diamonds. Sascha is an exceptional three stone diamond engagement ring. Available in 18ct White Gold, 18ct Yellow Gold, and 950 Platinum. Uniquely styled and exclusive to Serendipity. This ring design arrives boxed and gift packaged. Please allow around 4 weeks for craft. Discover your perfect three stone round engagement ring design. Consult with our expert team for dedicated advice and guidance. We are on hand to guide you on aspects of your purchase including diamond colour, clarity and carat weight. Let us advise you on metal choices. Choose from 18ct White Gold, 18ct Yellow Gold, 18ct Rose Gold, Fairtrade Gold and 950 Palladium. All three stone ring commissions are crafted with care and attention over 3-4 weeks until your item is ready to be shipped. We deliver the completed ring design, presented within a brilliant white and lavender satin presentation box, with courtesy pocket box for the perfect surprise proposal.